The ideal scenario for every restauranter, whether a Michelin-starred eatery or a self-described greasy spoon café, is perhaps a constant flow of satisfied customers giving you full tables without having to turn people away. This might not seem realistic, but SMS can help get you at least part of the way. SMS marketing has a proven track record of yielding a high return on investment in the restaurant and hospitality sector as a whole. With it costing no more than £3.50 to send a promotion to 100 of your previous customers, how many would you need to visit again as a result to get a positive return? Starting simply, by collecting your customers’ mobile numbers as they make reservations or place orders and asking for their consent to send them special offers you’ll find yourself with a healthy list of potential customers with a genuine interest in your establishment that you can tempt back time and time again. 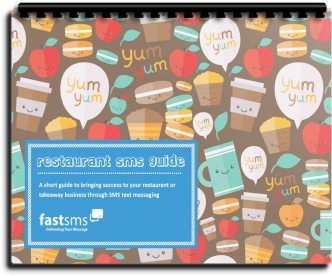 But there’s much more you can do with SMS in your restaurant business than marketing, it has the potential to streamline many of your other businesses processes.